Hunger in America: How to Help – ABC News. Do you realize that 1 in 6 Americans is hungry? If you have food on your table and in your refrigerator consider yourself lucky. communities to help those who are hungry, adults and children. Hunger knows no race or age. Hunger is something we CAN do something about. Sponsor a food drive at your work. Collect non perishable foods for donation. To be successful gathering food, it helps to offer suggestions as to what you want : canned vegetables, canned soup, dried soup mixes so you don’t end up with all one kind of item. If you know of a family who could benefit from food donation, make a donation basket or box and leave it anonymously. Make a whole bunch of cookies or bread and take it to a Ronald McDonald house or nursing home. Cookies and bread are feel good food and these people deserve to feel better. 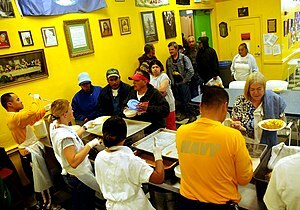 Volunteer at a soup kitchen or place that is serving holiday meals to the hungry and homeless. Deliver goodie boxes or baskets to women and children shelters. Get involved with your church groups outreach programs. Start your own community outreach-perhaps something that extends beyond the holidays. Hunger is year round. The most important thing is to DO SOMETHING! Please read the link from ABC News regarding Hunger in America. In the link there are ways to donate time, talent, money so we can all do something about hunger. Please do something, anything at all. Please take a look at this link from ABC News regarding Hunger in America here to help you identify ways you can make a difference. This entry was posted in Making a difference, The Life of a Chef and tagged do something, Donation, Food bank, get involved, Hunger, Hunger Relief, Philanthropy. Bookmark the permalink.